The Hyundai Tucson SUV will become the first mass-produced car on American roads to be powered by hydrogen fuel cells, the Korean automaker announced just days ahead of the model’s debut at the LA Auto Show. “These things are now ready for prime time,” said Hyundai’s North American CEO John Krafcik last week. Hyundai plans to begin selling the hydrogen-powered Tucscon next year in Southern California and gradually expand out to other markets as more filling stations are built. The cost of building such stations has always been one of the biggest obstacles to the willingness of carmakers to embrace the technology to meet the ever more stringent emissions standards imposed by the federal government. At the moment only nine such stations are open in California. The state legislature recently approved $100 million to build 100 more stations over the next five years, according to the California Air Resources Board. Safety is the other concern that had held back fuel-cell cars powered by volatile hydrogen stored in on-board fuel tanks. That issue has been overcome through many crash tests passed with flying colors by the Tucson, says Hyundai. With its aggressive push Hyundai is pulling ahead of Honda, its chief rival in the hydrogen fuel-cell segment. Honda will show a fuel-cell concept car at the LA Auto Show but won’t actually star rolling them off assembly lines until 2015. Toyota will also show a concept but will wait until 2015 to begin marketing them. GM is another company that has spent many millions developing a fuel-cell car. It had even released a test fleet of hydrogen-powered Chevy Equinoxes in the mid-2000s but has no definite plans to release one in the near future. The long-term future of fuel-cell cars appears to be assured, however. Last month eight states pledged to work together to put on the road 3.3 million cars powered by fuel cells, batteries and other zero-emissions technologies by 2025. The states are California, Connecticut, Maryland, Massachusetts, New York, Oregon, Rhode Island and Vermont which represent about 23% of the US auto market. 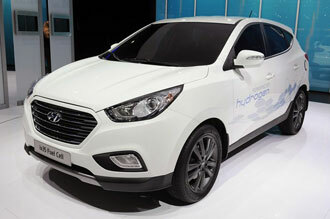 The Hyundai Tucson iX35 will become the first mass-produced hydrogen fuel-cell car to hit American roads in 2014.